This page appears to describe an abandoned project, game, etc.. The following is the look of an actual page. It's here to ease the discussion using [#number] links. However an actual (slightly outdated) test page exists. The invasions a?,b,c?,d,e? and g? are all joseki. The approaches f? and k? are a special strategy directly affecting the corner. The distant approaches h? and j? are part of a global strategy. The large takamoku was first developed as part of the shin fuseki experiments. Used several times by Kitani Minoru. Recently, it has been played by Yamashita Keigo and O Meien. The current layout is shown above. SJ should have all important terms linked just like any other page. Black and White should be written with capital letters if it's the players we're talking about. We prefer using english terms where possible (Excluding hane and the other inexpressible terms). Note how all links used for browsing variations are italic (tenuki would mean a term while an italic version, tenuki means a browsable move). Evan I have got rid of the line separators before the headings "moves explained" and "historical notes", the headings on their own are good enough - The line seprators are not needed so are just adding noise to the page. Names are structured like this: "Systematic Joseki" and either tenuki ("Tn") or coordinates (x-y where x is horizontal distance from upper right and y is vertical. First 9 locations are digits 1-9 and remaining 10 are a-h,j-k) meaning Systematic Joseki 4-4 Tn 3-a (resulting in a SystematicJoseki44Tn3a? address) would mean Black 4-4 White tenuki Black 3-10). The reason 3-a is used instead of 3-10 is to avoid a potential problem with SystematicJoseki1313? having 2 meanings - Either Systematic Joseki 1-3 1-3 or Systematic Joseki 13-13. Chances for a problem to arise are really small but we'd rather avoid it. Note that i is never included. It's done to avoid confusion with j. This naming is for SL use. Browsing is intended to be done using in diagram links. However users will be able to browse using current long names by alias when the project reaches a certain level of completeness. Even if it's meant for internal usage mostly, the name may be changed in the future. Note that when links become long writing them together is okay but one should leave the last move separate. For example a link to this page should be written as [SystematicJoseki3463Tn3343443223544553 2-2]. Variations leading to the same positions should be made alias to the already existing pages. Summary - Joseki/Special Strategy/Trick Play/Error - Name if it has one. In case it doesn't have a name, putting a path such as "Komoku Low approach..." may be possible instead. But because a number of paths may lead to a single position, it's still open. See discussion at the buttom. This is as self-explanatory as possible. Systematic Joseki isn't just a Joseki listing but will also have trick plays and wrong plays. Evan: I think this whole page heading needs a rethink, at the moment it is just a long list of words describing each and every move. Relating this chunk of information to the diagram is almost impossible and it's usefulness in general is minimal. On pages with a sequence more than five moves deep, this heading creates quite a lot of visual noise, making the page as a whole look cluttered. See SystematicJoseki3463Tn33434432235442 for an example and Bob Myers unfavourable comment on this issue. Change it to something better, ideas anyone? A cut down version maybe? nachtrabe: How about this format? Joseki - <Name of Joseki> (if applicable) - This Move's Name (Keima Kakari or whatnot). Then we don't have to worry about separate paths, clutter, or confusion. The size of the diagram is 10x10, some joseki will need a bigger board but it should still be recognisable as long as we keep the colors (Black moves first) and the orientation (Upper right corner and diagonal or below). Here we have the path which leads to the current page and the option of tenuki. Note that all of the previous steps are links (Current locations isn't). An example would be, SJ 4-6 Tn (Tenuki??) (Created with [SJ|Systematic Joseki] [4-6|Systematic tesuji] Tn ([Tenuki|Systematic Joseki 4-6]?)) which means the path was Black 4-6 White Tenuki, the (Tenuki??) is a control. Because the rest of the moves are links in the diagram, a tenuki shouldn't be too far. Everything but tenuki is shortened in order to save space for long sequences. If a certain path isn't to be developed in the near future, it should be disabled from under the diagram. In the example on the left (link source on the right), we see two working links and a disabled one. 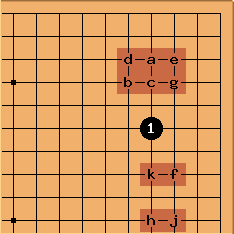 This section if for talking about the current sequence, particularly the last move in that sequence, it's reason for being played and its effects. This may develop into a discussion as people query what is said - if this discussion gets to long then it should be moved into the /discussion subpage. The following section is outdated, the original plan was to include statistics along with the notes about the previous move. Current thinking suggests this isn't needed or practical. Statistics based on the moves popularity over the years, eg. "first played:" should be added to the section entitled Historical Information. First Known Appearance: Sekiyama Riichi against Go Seigen in the Oteai, 1934-08-11. White plays next: ?(?) matches with ?(?) at a?, ?(?) at b, ?(?) at c?, ?(?) at d, ?(?) at e?, ?(?) at f?, ?(?) at g?, ?(?) at h?, ?(?) at j?, ?(?) at k? and ?(?) tenuki?. What does Black have here? after a tenuki? % Taken from gobase on the 2005-01-23. It might be needed in the future even it's not too helpful and will get outdated very fast. We have to be prepared to make changes easier. The ?(?) represent the played(won) ratio. ?/? is also possible. We should decide as early as possible. Statistics should have a date and a source included. Using a comment line as shown on the right. This shouldn't be italic. Because it starts with a % it's a comment line and won't be seen by regualr users unless they edit the page or chose to see it in their preferences. When the page is created without statistics, it still should include, % Taken from ? on the yyyy-mm-dd. should become Notes and quick statistics about tenuki after , and ?(?) tenuki should become and tenuki. This part gives the actual directions. Even if browsing using the diagram links or the links in the statistics is possible, one doesn't know what to expect or of the type of move he's in for. One can also name moves by type here by saying hane at a instead of simply a and meaning/type. Type - Joseki/Special Strategy/Trick Play or Mistake. Meaning - Emphasize the right etc. Should be a link to the list by meaning page. May be omitted if no information is available. Can be seen on the right. Because we already have the whole path navigation under the diagram there's no need to put it here as well. The discussion in clear view will help people see if there's a discussion page and hopefully encourage them to ask questions. Main categorisation by result, secondary by starting position. Main categorisation by starting position, secondary by result. Gronk: Think about Ishida's approach, which is to have a pictoral index at the front. So, I'm thinking of a page with pictures of the start of all of the fundamental joseki. One can quickly jump to those that would arise from san ren sei from the appropriate picture, rather than the multiple clicks it'd take to navigate through all the tenukis. Make sense? Also hold in mind that once the project reaches a certain maturity level, all pages with special meanning will be browsable as the previous joseki pages were using alias. Adding an [excersices|/excersices] page (and a link to the |>). What do we do with the statistics section? If it's to remain, note that it should be changed to statistic per position with a certain side to move, not sequence/move because of the next issue. Should the path be removed from the Summary - joseki - ... line? What about under the diagram? The reason for this problem is that several paths may lead to the same position. Would adding %%% support under the diagram for multiple paths be useful?